At least she’s not trying to hug helicopters. I’m not traveling at the moment, but I am waiting for other people’s flights to come in. As always, it’s a mix of boredom and anticipation. But at least there’s no red giants trying to grab airplanes at the moment. As far as I know. Really, it’s her fault for being in the way. I hope no one reading this ever gets in a car crash. Cars are among scariest things I’ve ever seen, and I’ve flown on airplanes through storms. But hey, at least I don’t have to worry about being hit by toy cars. A stick person’s not gonna do much damage even going fast if they ram me, so…huzzah for that? It’s actually a really shallow ocean. Ever played those games in the water where you balance on someone else’s shoulders and try to knock everyone into the water? I miss that. You can’t play those games by yourself, and especially if you don’t have an ocean, or at least a pool nearby. Anyways, Knight’s strong. 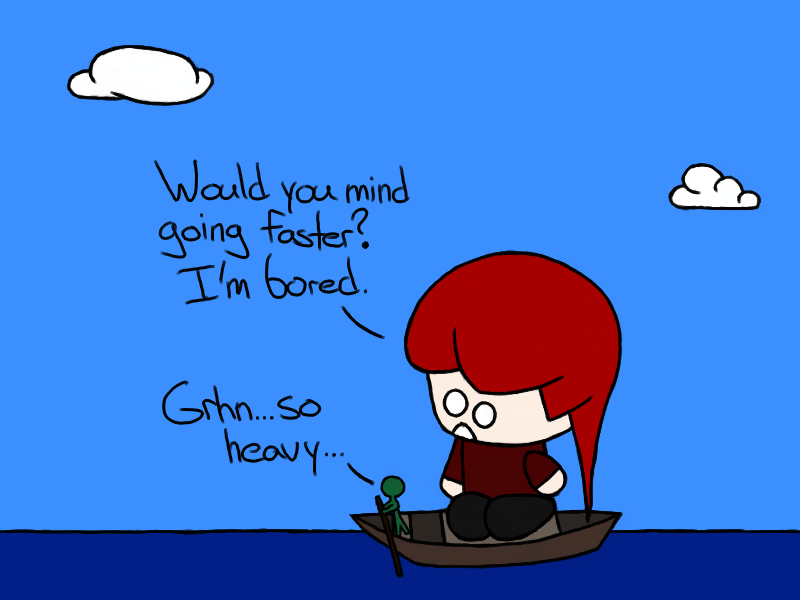 She can easily lift Pirate and as many stick people as she needs. Doesn’t mean she’s going to be happy about it, though. For budget trips, use turtles. I actually don’t like turtles in reality that much. But if I could ride a giant turtle, I probably would. It might not get me there very fast, but I’d enjoy the peace and quiet. I prefer cars or walking, myself. Is…is this what rich people do? I mean, I’ve heard about carpooling although I haven’t ever done it myself, but what about helipooling? Yachtpooling? Jetpooling? Some people have private jets — I can’t imagine that they wouldn’t give friends a lift. You may think this is a stupid idea, but I totally bet it happens. Just wait until she falls asleep. Toll booths are the only reason why I keep my change. That, and to buy overpriced soda when I’m on the road. Anyways, Pirate could probably extort a few quarters from stick-people going to work. I’m also taking one of the great Jane Austen’s quotes and misusing it. I feel bad about that. Who needs insurance when you have armor? Snow driving is hard. I saw an accident on the highway today — you really forget how fragile cars are until you see them break. Fun fact: apparently cars today are built to easily collapse to protect the passenger. Cars back in the day were tanks. Sort of like Knight. And once again, cardboard boxes save the day! 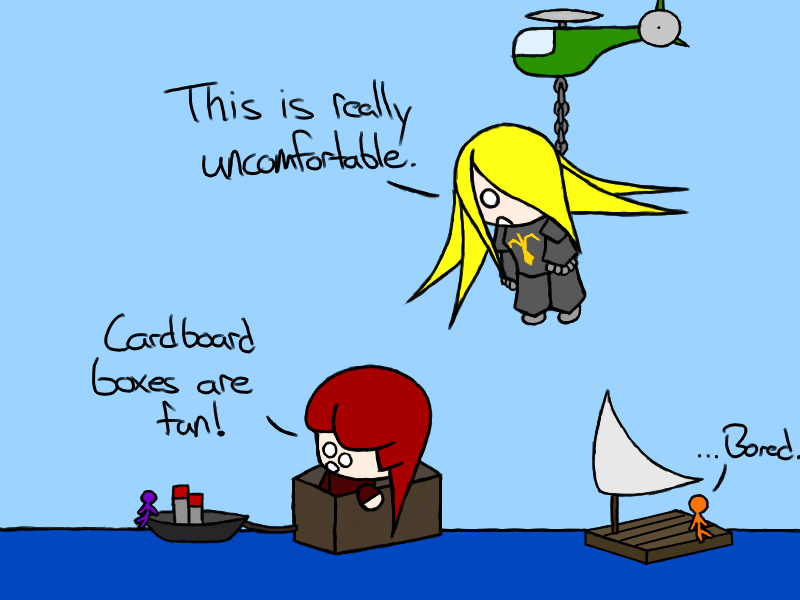 I wonder if you really could float across the sea in a cardboard box. I hope I never have to find out. I like gondolas. Never ridden on one myself, but maybe someday I’ll go to Venice and ride on one. Then again, maybe I’ll just imagine it and ride a kayak instead. That seems a lot cheaper. My point here is that gondolas sound cool and you should ride on one if you get the chance. There should be a weight limit on those things. Pirate’s got a problem with insulting Knight. In fairness, both Knight and Pirate are really light since they’re kids, but one wears armor. 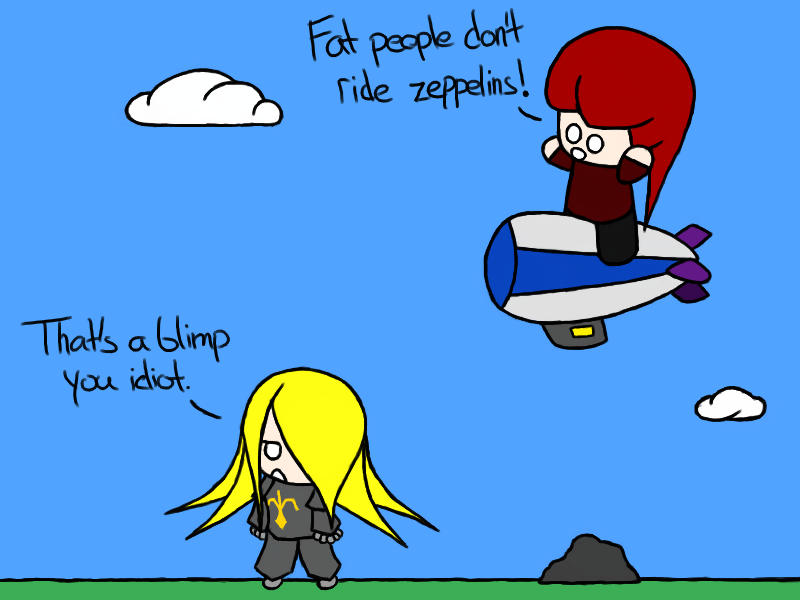 Also, I learned the difference between blimps and zeppelins today. Let’s just hope it’s not the Hindenburg.